BMW is busy at the Paris Motor Show these days, taking care of everyone wanting to get a closer look at the new 3 Series. 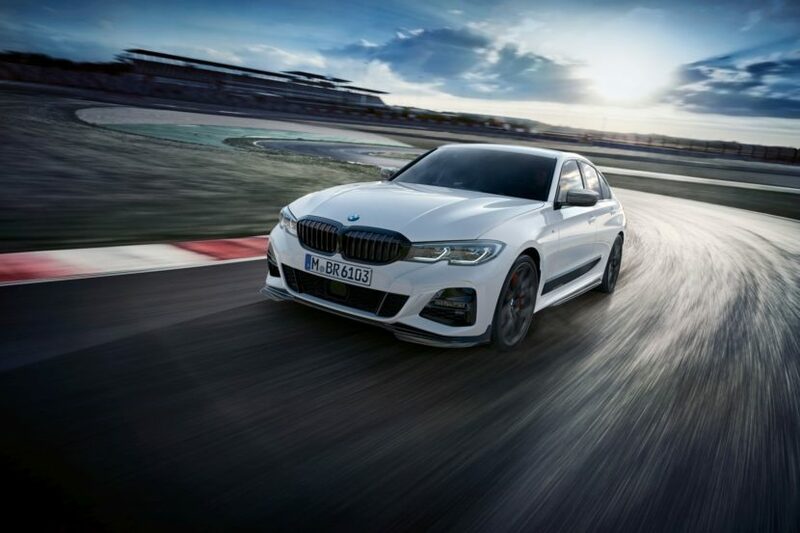 The brand new 3er was unveiled today, but at the same time, BMW has also unveiled a first batch of M Performance Parts for the new sedan, highlighting the importance Munich is paying to this division. 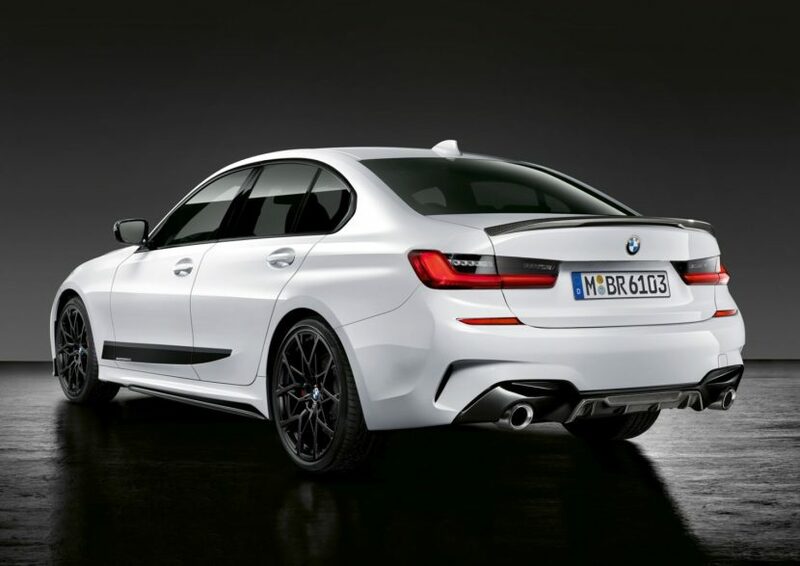 The add-ons are meant to emphasize the aggressive design of the M Sport models and offer a bit more performance at the same time. As usual, BMW says these parts have been developed on the track and are not just meant to look good but have practical purposes as well. All components are plug and play and they do change the way the car looks, especially on the outside. You can get a varied range of parts for your car’s exterior, enhancing its aerodynamics in the process. You get ten items for the car’s body, all of them either in high-gloss black or carbon fiber. There’s an M Performance front splitter on the table as well as a ‘front splitter pro’ along with a rear spoiler and rear diffuser. All of these parts are available in a choice of carbon, black high-gloss or black matte and optimize the air stream around the vehicle while reducing uplift. The M Performance exterior mirror caps made of carbon fiber are also available as are the M Performance side sill films. They stretch over the entire lower sill and contain the M Performance branding inscription. Last but not least we should mention the grey back lights and M Performance tailpipes. Brakes can also be upgraded thanks to the M Performance catalogue. The M Performance 18″ braking system is recognizable from the red color of the brake calipers. The sports brakes feature considerably enhanced deceleration performance for sporty driving according to BMW. Compared to the serial-production brakes, the 18-inch brake discs are bigger, perforated, grooved, and lighter. They have a higher thermal resistance and come with four-piston brake calipers made of aluminum, to shed some more weight. 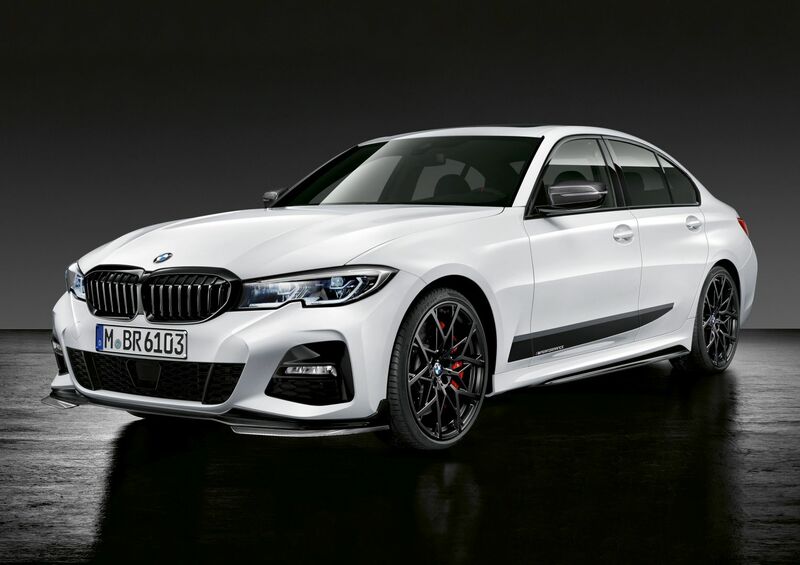 As far as the rims go, the range of M Performance wheel sets will comprise four designs in two sizes at the market launch of the new BMW 3 Series Limousine. The 18-inch matte black M Performance light alloy double spoke 796M wheels are suitable for use both in summer and winter. In 20-inch size, the choice is between the M Performance forged cross-spoke 794 M bicolor wheels (jet black, burnished) and the 20″ M Performance forged Y-spoke 795 M wheels, in either bicolor (ferric grey matte, gloss lathed) or black matte. Inside the cabin you can now get an M Performance steering wheel, with its highly distinctive grip areas and large thumb rests, red center marking at the ‘12 o’clock’ position, and silver-grey, hand-sewn cross-stitch seam. 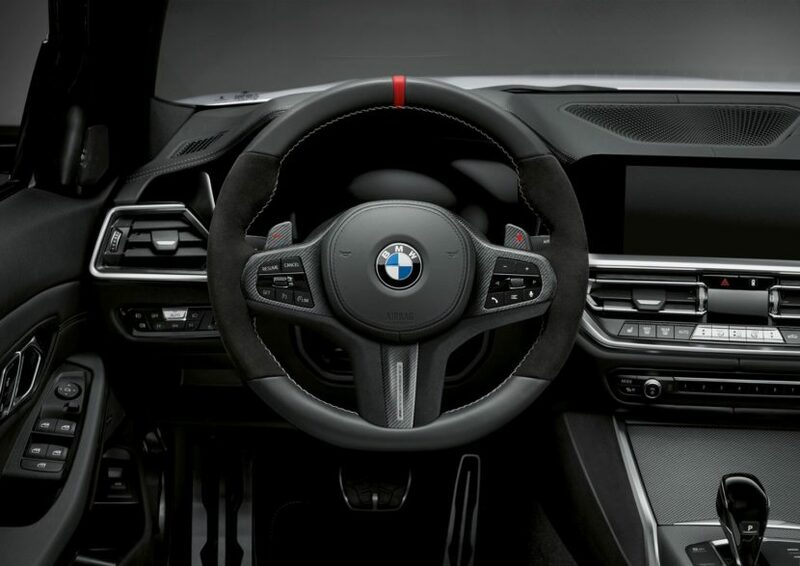 The racing look can be further enhanced by the carbon-fiber shift paddles (for models with Steptronic sport transmission) and the M Performance steering wheel trim panel made of carbon fiber with an Alcantara insert and M Performance inscription. To match this there is also the carbon-fiber interior trim, also with an open-pored structure. For true track enthusiasts, BMW is now offering a drive analyzer. The system consists of an OBD stick that is plugged into the on-board diagnosis interface, and a smartphone app. The drive analyzer is derived directly from motor racing and supplies the driver with all important driving dynamics data, as well as offering extensive professional recording and analysis capabilities. You can also record trips with a smartphone video camera, including cumulative driving data and route calculation using GPS positioning data.